The value of modern art can be as much about the mystique of an individual as what the canvas holds. In today's market, reputation and a recognizable style can mean everything. Indigenous artists are no different, but the significance of traditional designs can extend far beyond the limits of one artist's personality. For centuries the indigenous Yolngul people of northeast Arnhem Land in Australia have connected with ancestral beings through song, dance and painting. Their artwork has been used to lay claim to a remote region of islands and seacoast not far from Indonesia. This week, the Harvey Art Project Gallery at 391 First Ave. N. in Ketchum will host a multidisciplinary exhibition of artists, singers and musicians from Arnhem Land, where making art has become a matter of cultural survival. "An artist inherits rights to a story when they are initiated," said curator Julie Harvey. "There are several layers of initiation, each with more knowledge and more information." Harvey studied at the Adelaide School of Fine Art, specializing in Australian Aboriginal traditions. 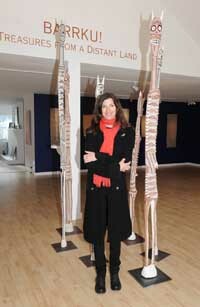 She and her husband, photographer Paul Exline, will visit Arnhem Land in May, after the temperature cools off. "It's about 110 degrees there now," she said. The Harvey Art Project will host "Barrku: Treasures From a Distant Land" from Dec. 29-30, featuring short films and a talk at the Community Library in Ketchum, and traditional ceremonies and music at the gallery. Visiting artist Wukun Wanabi will tell stories about the Yolngu people. He will be joined by Buku Larrngay Mulka Art Center Manager Kade McDonald. The Art Center is located in Yirrkala in Arnhem Land in the Northern Territory of Australia. Arnhem Land has been occupied by indigenous people for tens of thousands of years and is where archeologists discovered the oldest-known stone axe, which scholars believe to be 35,500 years old. "These are the oldest continual artistic traditions on earth," she said. "Some artists came out of the bush as late as 1983 totally naked, living fully as hunter-gatherers. In the desert regions of Australia, Aboriginal people navigated on long walks using "song lines," which correlated landmarks, and "Dream-Time" stories with traditional songs and rhythms. Knowledgeable people could sing their way across hundreds of miles of the Australian outback, crossing ethnic and linguistic barriers en route to distant places. Modern-day Yolngul artists inherit the rights to paint the mythic essences of their birthplaces, depicting totemic creatures and geographic locations from a parallel universe known as the Dream Time. Harvey said the Dream Time is not a mythical place in the past, but a parallel time and place that can be connected to in the present. "The Dream Time is when everything came into being—birds, the waters, crocodiles, stars and also the laws of society," she said. "An artist will sit and sing up a dreaming story, and this is what they will then paint." The paintings are made on the thick bark of the "stringy bark" tree, using natural ochre pigments, or on the outside of logs hollowed out by termites. Other artwork on display at the Harvey Art Project gallery this week includes spirit figures and ceremonial poles. In some cases, an artist will retire a particular motif upon his or her death. At other times, aboriginal art has been used as a tool to return land and sea rights for native people in the region, many of whom had been disenfranchised by colonial powers. In 1963, artists from Yirrkala sent a petition on tree bark to Parliament House in Canberra to protest mining on their traditional lands. While the petition failed to stop the mine, the protest marked the beginning of the aboriginal land rights movement in Australia. In 1975, the Buku Larrngay Mulka Art Center was established in Yirrkala. Yirrkala artists have supported many international exhibitions over the last 35 years, winning many awards and educating the outside world about Australia's Aboriginal traditions. By the mid-1980's Yirrkala's Yolngul people were the first group of Aborigines to successfully win a high court challenge to have their lands returned to them as traditional owners. "Art provides them with an economic resource," Harvey said. Each piece of artwork at Harvey Art Project has a detailed story drawn from Yolngul oral history, often depicting the mythical creatures of the Dream Time. But many of the "barks" have no discernible narrative motifs, appearing instead as abstract designs and patterns. Harvey said the traditional symbols of birthplaces and beings are sublimated within some of the more contemporary designs.